With the backdrop of the illuminated Rainbow Bridge and Tokyo skyline, the image of a giant white shark is captured during the Odaiba water illumination show. The show is projected on to a huge water screen, 15 metres high 40 metres across, created by a fountain set along a beach at the Odaiba Kaihin Park. 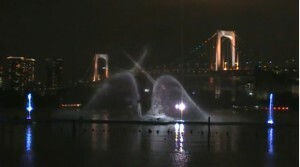 Odaiba water illumination is performed four times after 18:30. Among the many images screened are frolicking dolphins, tropical fish, a whale and the famous maoi figures from Easter Island in the south-eastern Pacific Ocean. 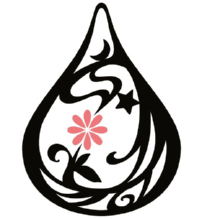 Hi… where it view it from..?? Odaiba island… or somewhere from Tokyo mainland… ?? Aseem: Odaiba. Its the island with the fake beach in Tokyo metropolis. You take the Yurikamome from Shimbashi station. My question is what nights does it run? Weekends or all days, and when until?